For 2019–2020 academic sessions, the Board will conduct common entrance examination titled JELET-2019 for lateral entry into 2nd year (3rd semester) of the four-year courses of Bachelor’s Degree in Engineering / Technology and Pharmacy. Candidates are required to go through the Information Bulletin carefully before applying for the examination. Any application not in compliance with the conditions specified in the Information Bulletin is liable to be rejected. 1. 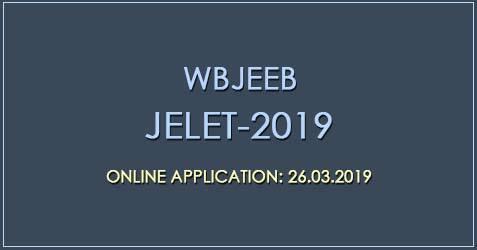 Application for JELET-2019 must be done online only. There is no printed application form available. 3. It is essential to have a mobile number and a unique email ID. All future communications will be sent to the registered mobile number and email ID. WBJEEB will not be responsible for non-receipt of any communication by the candidates if the mobile number and/or the email ID are wrong/non-existing/nonfunctional/changed. 4. Once the registration details i.e. name, father’s name, mother’s name, gender and date of birth are entered and submitted, they cannot be changed/modified/edited under normal circumstances. Also, the information must match exactly with the school admit cards, mark sheets, certificates, photo identity cards, caste/category certificates etc. which a candidate has to produce at the time of entering the examination hall, during counselling, during admission and during registration with the University. 6. Do not share your application number; pass word, security question/answer with anyone. 9. If any candidate receives any SMS/email regarding discrepancy in photograph/signature uploaded by him/her, he/she must take corrective action immediately within one day. 10. Application fees for JELET-2019 is Rs. 500/- (Rupees five hundred only) plus the Bank’s Service Charges, as applicable, payable by Net Banking/ Debit Card/ Credit Card. Payment status is updated automatically and hence should show ‘OK’ immediately after the payment. But in some rare cases it may be delayed due to delay/failure in the Bank’s network or transaction failure at the Electronic Payment Gateway (EPG). If the payment status does not show ‘OK’ immediately after making the payment, then the candidates are advised to make payment once again. 11. Keep copies of confirmation page, admit card in safe custody. It is not possible to generate any duplicate copy. No candidate will be allowed to seat for the test in any centre other than the one allotted to him/her and as is mentioned in the admit card. Any candidate found to occupy a seat other than the one allotted to him/her will be reported against & his/her paper will be cancelled. Carry the following documents in order to enter the examination centre. A hard copy of admit card. Any photo identity card in original such as Aadhaar card/ Pan card / Passport/ Voter card / 10th standard admit card / School – ID card. Frisking may be carried out while entering the centre for checking prohibited objects. Candidates are advised to take their seats at least 15 minutes before the test. No candidate will be allowed to enter the examination hall beyond the scheduled time of commencement of the test under any circumstance. Candidates are not allowed to carry any written or printed material, calculator, pen, docu-pen, log table, wristwatch, any communication device like mobile phones etc. inside the examination hall. Any candidate found with such items will be reported against & his/her candidature will be summarily cancelled. Question booklets will be distributed well before commencement of the test. Take out the OMR sheet without breaking seals of the question booklet and check that your OMR number & question booklet number are same. If not, ask the invigilator to replace the whole set from same series. Put your signature on the top of question booklet. Read instruction given on OMR & on the cover page of question booklet very carefully. Write question booklet number & roll number at the appropriate places on the OMR. Wrong entry of question booklet number & roll number may lead to rejection of the OMR or wrong scoring, for which the Board will not remain responsible. If any candidate makes any mistake, he/she must not over write. Request the invigilator to strike it out & rewrite the correct numbers and put his/her signature. Darken appropriate bubbles of question booklet number & Roll number. Write your name in BLOCK LETTERS, name of the centre & put your signature in appropriate places on the OMR. Do not put any stray mark anywhere else; it may lead to rejection of OMR. Check that your Roll number, photograph, spelling of your name in the attendance sheet matches with those given in your admit card. If any correction is needed, bring it to the notice of the invigilator. Question booklet seals can be opened only at the time of commencement of test and as will be announced by the invigilator. Check all the pages of question booklet. If there is any damage or missing page or any difficulties to read the question booklet, ask your invigilator to replace the whole set from the same series. Maintain silence during the test. Any conversation/gesticulation or creation of disturbances will be deemed as misdemeanor. If any candidate is found adopting any unfair means, his/her candidature will be cancelled, and / or he/she will be debarred either permanently or for a period as is deemed fit by the Centre- in- Charge. No discussion will be allowed with the invigilator regarding any question. Candidates may do rough work in the space provided in the question booklet. No candidate will leave his/her seat without permission of the invigilator until the test is over. No candidate will leave the hall till the end of the test & all OMRs are collected & tallied by the invigilator. Candidates can take his/her question booklet after the test. If any Examinee is found impersonating, he/she will be handed over to the police & candidature of the original candidate will be cancelled outright.